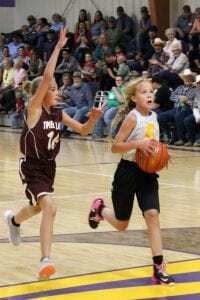 Dupree’s Jessa Hunt, playing on the 6th grade team, handles the ball as everyone hustles down the court. To her left is Dupree’s Jaecyn Starr. 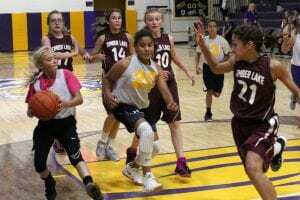 At the buzzer, in a complete flip from the previous 5th grade game, the Timber Lake 6th grade team won 20 to 4.